Sixteen years later his parents immigrated to the U.S. with 6 siblings; father, Berend and mother, Kunje (Clara). Berend (25) and Clara (22) married October 25, 1858. The family sailed from Antwerp, Belgium on May 9, 1885 aboard S.S. Belgenland. Berend, a farm hand, was the son of Jan Watzes Noord, laborer and Zwaantje Kornelis. Clara, a servant girl, was the daughter of Bote Gosses de Jager and Sara Heerkes Pol. Elizabeth married about 1889, JACOB BOUWMAN. 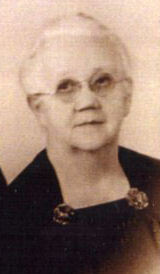 In the same year as Elizabeth, Jacob was born September 27, 1869 in Uithuizen, Netherlands. He arrived in the U.S. much earlier at the age of 3. 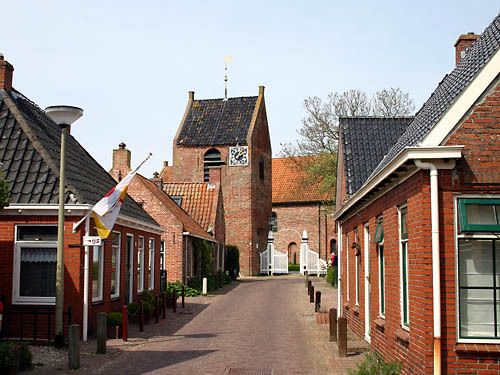 The village of Ezinge contains the largest "wierde" (mound) of Groningen province, with its own museum. It exists with Winsum municipality in Groningen province. Formed 1 Jan 1990 by the merger of the two other municipalities, Adorp and Baflo. It is just north of Groningen city, along the "Reitdiep" canal, and along the railway Groningen-Roodeschool. The Winsum municipality flag has three wavy stripes, proportioned 3:1:1, green - white - green, with on the top stripe four yellow seven - pointed stars in a row. adopted 23 Jun 1992 by municipal resolution. 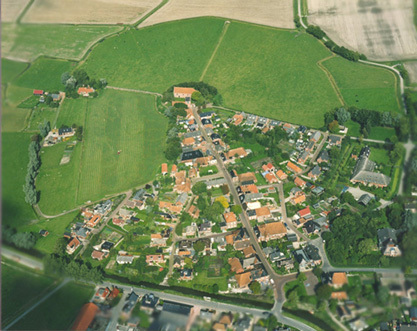 The Ezinge Kerk (Church) at the end of this street scene, is visible in the center of aerial view above.